February at the Sanctuary Point Garden sees the arrival of the most exquisite selection of Crepe Myrtles in either tree or shrub form. Crepe Myrtles come in all shapes sizes and colours and we stock lots of different types of Crepes to ensure you get the perfect specimen for your garden. Along with our Indian Summer, late flowering Crepe Myrtles which includes Biloxi, Lipan, Natchez, Zuni, Tonto, Sioux, Hopi and Tuscarora, we have some very special offerings developed and bred by Touch of Class Plants. They feature flawless near-black foliage that emerges in early spring, followed by masses of vivid blooms from summer until first frost. The range grows to 3m x 2.5m in height and width. Their compact growth habit makes attractive flowering hedges or beautiful trees to line your driveway or fence. 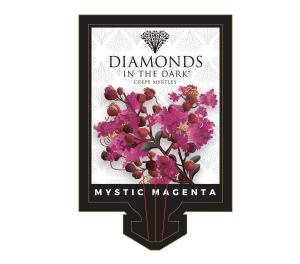 The Diamonds in the Dark® Range are perfect for planting in decorative pots to place on your deck, porch or balcony. Diamonds in the Dark® are deciduous plants and will generally lose their foliage between late autumn and mid winter, stunning new growth will re appear in spring. Their colour range consists of Crimson Red, Lavender Lace, Blush, Mystic Magenta, Red Hot, Purely Purple, Best Red and Pure White. Enduring Summer Red Crepe Myrtle really lives up to its name. 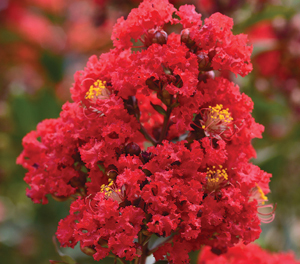 It is one of the earliest flowering Crepe Myrtles available with the first flowers appearing in late November; Enduring Summer Red continues to re bloom all summer long and into autumn with an abundance of bright red blooms. During spring, stunning red leaves appear before changing to a glossy green foliage prior to flowering. 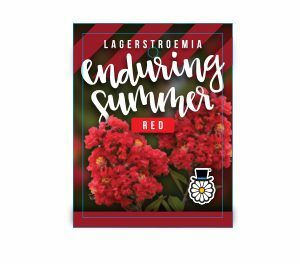 Enduring Summer Red is a medium shrub with a compact habit and grows to around 1.5m, it prefers well drained soil and should receive at least 8 hours of summer sunlight to flower at its full potential. Infinitini Crepe Myrtles are a space saving, robust, compact plant growing 60 to 75cm high. They have serious flower power and are perfect for any garden large or small. 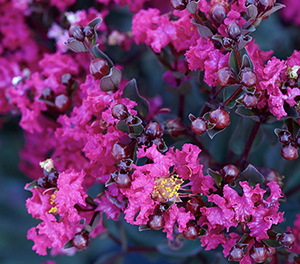 Infinitini Crepe Myrtle Magenta features masses of rich, dark magenta pink flowers from early to mid summer and re blooms continuously until mid to late autumn. Infinitini Crepe Myrtles require free draining soil in a sunny position. Prune to 1/3 of its size in late winter while deciduous and fertilise for strong spring growth. 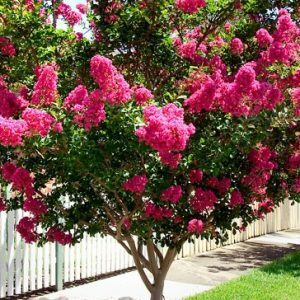 The unique small size of Infinitini Crepe Myrtle ensures everyone has room for a beautiful Crepe Myrtle in their garden; they are perfect for brightening up the landscape in summer, will grow happily in a decorative pot and make an eye-catching display when mass planted.